With the release of Book I's Portuguese edition and my trip to Comic Con, we ended the year with a blast! December was a very full month, but a very good one as well. To start off the year, I've got a full overhaul of the website; hope it runs smoothly. Check out below the trailer for my presence @ComicCon2017, as well as a few select photos with some amazing cosplayers that were kind enough to stop by (thank you so much!). Goal for 2018: getting work done on having Book II's Portuguese edition ready for sale! I'm basically done with writing Book II: Penance By Fate. In about a week it'll go to print, and by December I'll have it ready for shipping! I'll be having a book presentation at Fnac Coimbra by the 17th of December, see you all there! Down below, check out a preview of the amazing book cover designed by Omar Diogo, at Veludo & Mentol! Greetings and a very happy new year, everyone! 2015 is behind us, and with 2016 comes a new year resolution of having Book II - Penance by Fate finished and ready for publishing by the end of the year! Writing has been coming along nicely and steadily and I can safely state that I'm officially past the middle point in the story. Below, for your reading pleasure, you can find a small, Book II spoiler-free, excerpt from a chapter that I really enjoyed writing, with an intense conversation between two characters whose true identities will yet remain to be unveiled. I have also updated the gallery with some new promotional material, so do check it out for some amazing character promos! Happy 2k15 readers and writers alike! After quite a bunch of hours spent in subbing work, the interview is ready for your viewing pleasure! And now, to get back to Book II, which has been missing me sorely! After a couple weeks of time off, I'm signing in to say that Central Comics Fest went really well! Despite not having an enormous crowd, the event was a breeze and I managed to sell most of the signed copies I had with me. But even more importantly, I believe I got some very interested readers acquainted with Demon's Blood, and I really hope everyone enjoyed the T-shirts and promotional material I handed out. On other news, below is the interview I had with GeekFreak, for RUC, a few weeks ago. 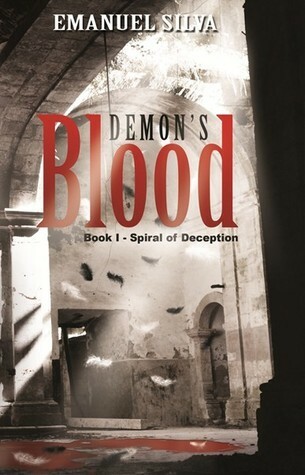 Check it out for some Q&A about Demon's Blood: Spiral of Deception! (English Subs should be up and running in a few days, sorry for the delay). O Coimbra Live City esteve na Rádio Universidade de Coimbra no programa Geekfreakruc e filmou a entrevista feita a Emanuel Silva autor do livro Demon's Blood.Assiste a esta entrevista e fica a saber um pouco mais sobre o autor e o seu livro. The Goodreads giveaway is going well, already past the 200 requests! Posting to announce that if the entrees number goes past 500, I will be holding a second giveaway so a couple of extra interested readers can get a signed copy or their own!